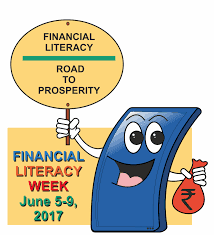 To emphasize the importance of financial literacy, it has been decided to observe the week June 5-9, 2017 as Financial Literacy Week across the country. The literacy week will focus on four broad themes, viz. KYC, Exercising Credit Discipline, Grievance Redressal and Going Digital (UPI and *99#). The five messages that will be communicated to the common man based on the above broad themes are available under "Financial Literacy Week" in the downloads section of the financial education webpage of RBI. Local language versions of the posters (A3 size) to display in bank branches, flyers (A5 size) for distribution to camp participants and charts (A2 size) for use by trainers during camps would be printed and provided by the regional offices of RBI. Each bank branch would be provided with 5 A3 size posters (1 set of 5 posters). Each rural branch would additionally be provided with 500 A5 size flyers (100 sets of 5 flyers) for distribution in camps & bank branches and 5 A2 size charts (1 set of 5 charts) for use by rural branch managers during conduct of camps. Each FLC would be provided with 5 A2 size charts (1 set of 5 charts) for use by FLC Counsellors during conduct of camps and 1000 A5 flyers (200 sets of 5 flyers) for distribution to camp participants during camps by FLCs. Banks are advised to make logistical arrangements to collect the posters/flyers/charts from the Regional offices of RBI during the first two weeks of May and distribute the same to their branches and FLCs well in advance before the Financial Literacy Week. Banks to advise their Financial Literacy Centres to conduct special camps on each of the five days in backward/unbanked areas. FLC Counsellors may utilize the charts of A2 size for training purposes. FLCs may distribute the promotional material of A5 sizes to the participants. All bank branches in the country may display A3 size posters on the five messages in the local language in a prominent place inside the branch premises. These posters will continue to be displayed for at least six months in the branch premises even after the Financial Literacy week is over. All Rural branches may conduct one camp on any of the five days of the week after branch hours. An online quiz will be hosted for the general public on the four broad themes to generate interest/awareness about financial literacy. Details of the quiz will be intimated shortly through our website www.rbi.org.in. It is our endeavor to reach out to the common man during the Financial Literacy week and we seek the whole hearted co-operation from the banking fraternity at large in making this event a grand success.